Features members of A Fistful of Spookies (UK), The Singing Sous'Chefs, Three Choirs Festival Chorus, The Spooky Men's Chorale (Aus) and a Bargain Hunt expert. Simon Batten, Oliver Carpenter, Ben Cooper, & Adrian Mealing alive in the Malvern Hills. Directed by John Nicholson of Peepolykus Theatre Company. Played 200 shows across the British Isles. According to the Oxford dictionary, the meaning of a cappella is: “(with reference to choral music) sung without musical accompaniment”. So now we know. Or perhaps we don’t. For if you didn’t take the advice of the local ticket-sellers that ‘there was nothing worth watching on TV on Thursday 29th March so hot foot it down to the Village Hall for the evening’, then unfortunately you missed out in a big way - you will have no concept of the feast of entertaining music, comedy, contemporary topical comment, wit and banter that “MEN IN GENERAL” brought to the Village on the night. As for the words “choral music” in the definition, purists might not understand the connection to Marvin Gaye, Billy Joel, Rogers and Hammerstein, The Beach Boys, and even the veritable King Elvis, but the near-capacity audience was enthralled throughout the show nevertheless. As reported by other commentators, the five man group blend together seemingly seamlessly - (try and say that quickly when you’ve had a few!) 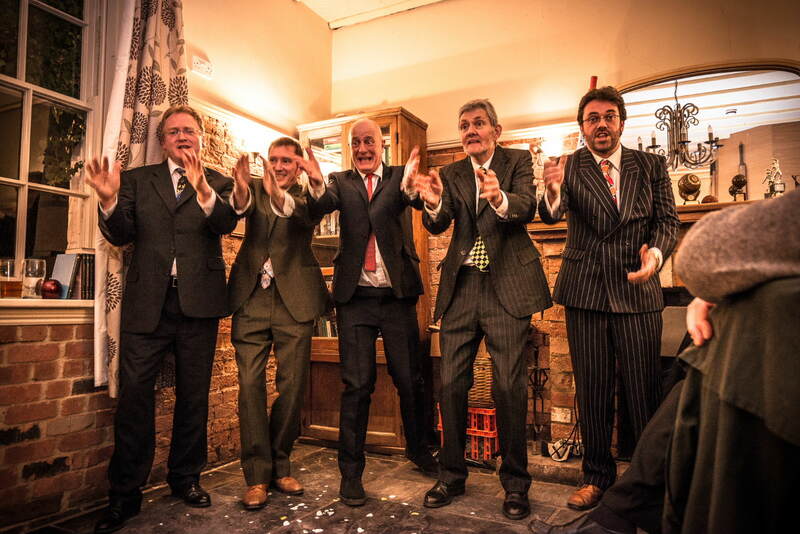 - a range of musical and storytelling styles that represent a cross between Monty Python and a Barber Shop Quartet, with a formidable undercurrent of typical male blokeishness. (By the way, this last word IS in the Oxford dictionary!) Their multi-various comical movements and stances, coupled with ever-changing quizical facial expressions, kept the performance zipping along. And, of course, the harmonious singing was faultless and the lyrics very imaginative and refreshing. Into the bargain, they got the audience into the act as well - especially launching the embryonic stage career of Harvington's very own Isobel. A thoroughly enjoyable and memorable evening. Co-cooked by Jim Howden, Adrian Mealing & Will Tooby.